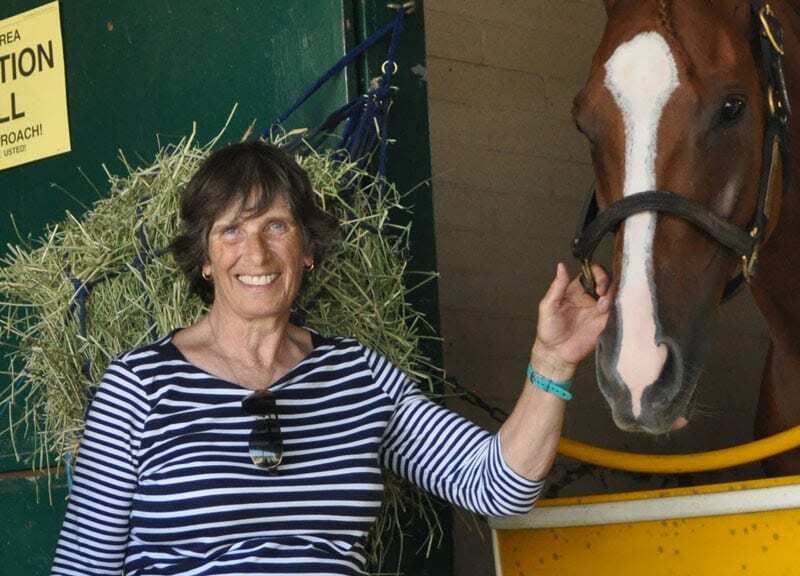 Martine Bellocq, the courageous trainer who went into the fires of hell in an attempt to save her horses last December at San Luis Rey Downs training center, has been selected to be the recipient of the 15th Laffit Pincay, Jr. Award. The prestigious honor and handsome trophy named for, and bestowed by, the Hall of Fame rider will be presented to Bellocq on Saturday, August 18, the day the track runs its signature race, the $1,000,000 TVG Pacific Classic. Bellocq, who suffered life-threatening burns over much of her body, then had to go through a series of demanding surgeries and subsequently lost a foot due to circulation complications. Despite all that, she has steadfastly worked her way back from near death in a display of strength and spirit that has amazed her doctors, family and friends. When she leads the contingent of heroes who'll be on board that afternoon, she'll be making her first public appearance since the December 7 fire. Bellocq will be joined by her family, including her husband, Pierre, as well as many of the trainers, grooms and other stable hands who released trapped horses that afternoon when a wind-whipped fire raced through eight barns at the 250-acre training site which housed more than 400 Thoroughbreds at the time. The raging blaze took the lives of 46 horses, but if horsemen had not valiantly fought their way through fire and smoke to release their penned up animals, the majority of those horses undoubtedly could have been lost in what might have become the worst fire disaster in racing history. Also among the “heroes” who'll be saluted August 18 will be the staff of the Trifecta Equine Athletic Center, which is located directly across the street from San Luis Rey and whose workers sheltered and treated 101 injured and terrified horses throughout the night of the fire. The Pincay Award, which has gone to such racetrack notables as Hall of Fame rider Mike Smith, California Chrome's trainer Art Sherman and Zenyatta's owners Jerry and Ann Moss, is awarded to those who have served the sport “with integrity, extraordinary dedication, determination and distinction.” All of those attributes would seem to apply fully to the “heroes of San Luis Rey,” led by the indomitable Bellocq. The award will be given in a ceremony between races on Pacific Classic Day, but also will be saluted at a special Winners Foundation gathering the night before at L'Auberge Del Mar, the luxury hotel in the heart of downtown Del Mar. The fundraising pre-event will be held from 7 to 10 p.m. with many riders – including Pincay – trainers and owners expected to mix and mingle with racing fans who come on board. Cocktails and hors d'oeuvres will be served and an auction of unique racing items, prizes and gifts will be conducted. Tickets – with all proceeds going to the Winners Foundation cause, which is to fight drug and alcohol problems among those in the racing community – are $150 and are tax deductible. They can be purchased at the door on the night of the event. For further information, it's best to go to the group's website (winnersfoundation.org) or call them (626) 574—6498. Bellocq and her husband, also a trainer who was at San Luis Rey the afternoon of the fire and aided in his wife's evacuation, come from a racing background. Pierre's brother, Remi, has held various executive posts in the industry and currently is executive director of the North American Racing Academy in Lexington. Their father, also Pierre, is more famously known as PEB, the celebrated equine artist and cartoonist whose colorful and whimsical works filled the pages of Daily Racing Form and other publications for decades. His majestic mural depicting the history of Del Mar through its people and horses occupies a huge portion of a wall in the track's Clubhouse entranceway. It is hoped that the 92-year-old artist will be able to join his daughter-in-law at Del Mar for her award. Pincay was at one point the world's winningest jockey with 9,530 victories. He rode for 39 seasons including 27 summers at Del Mar, where he is still the leading rider with 1,011 firsts. The Panamanian native was voted five Eclipse Awards as the nation's foremost rider and led the country in earnings seven times. Now 71-years-old, he lives in Arcadia near Santa Anita and maintains his fitness and awareness of the game. This entry was posted in NL Article, People and tagged laffit pincay, laffit pincay award, martine bellocq, pierre bellocq, Pincay Award, San Luis Rey Downs, san luis rey fire by Del Mar Thoroughbred Club. Bookmark the permalink.